Those of you who read Damian Thompson’s Holy Smoke blog on the The Daily Telegraph’s website will know that he is not backward in coming forward. Indeed his in-your-face style is a little too much for some. That said, sometimes he hits the nail on the head, or comes very close to it. 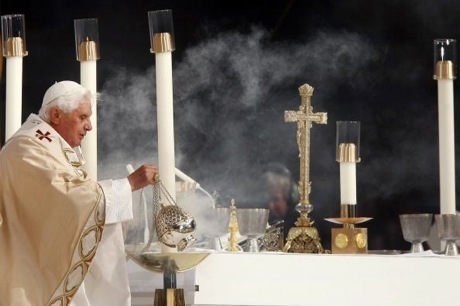 In a recent post on his blog he quotes with approval a leading article in The Catholic Herald which held that the Pope showed us in his visit to the UK that the Ordinary Form of the Mass can be celebrated with solemnity, dignity and beauty. Indeed this is true. He then highlights the welcome papal practice of celebrating the Mass facing a crucifix on the altar. In so doing the Pope is making it clear that, though he might be facing towards the people, his inner and liturgical direction is to the east, towards Christ who is the focus of the Mass, especially as the priest makes present on the altar Christ’s self-sacrifice to the Father. How often have we seen a priest reciting the Eucharistic Prayer with grand gestures and exaggerated intonation of voice that make it obvious his focus is on the people. This is the natural consequence of his facing the people, with no other visual reminder of his proper direction and focus. The altar crucifix is a happy compromise between the ancient and (until the 1960s) consistent practice of the priest facing east at Mass, and not alienating the majority of the laity who, not having been catechised properly as to what happens at Mass and why, would imagine (and sometimes mischievously be told) that the priest is celebrating with his back to them (negative spin which masks the true reason – that the priest is one with the people facing Christ). The altar crucifix represents what is called liturgical east. The benefits are enormous. The focus is immediately taken off the priest, who all too often feels (often unconsciously) that he is the star of the show, and must thus perform to keep people’s interest and attention. This is a relief for most priests, and probably would be a relief for most laity! But back to Mr Thompson’s blog. He concludes by asking if the reader’s parish priest uses an altar crucifix, concluding that the priests who do not use one will be making a statement (one of defiance to the Pope) rather than those who do. This is a telling point though it may not be universally applicable. Never underestimate the strength of inertia. Some priests will not adopt the altar crucifix because it never occurs to them to do so, and if it does, the change is too much hassle. Moreover there may be some priests who would like to adopt it but fear a backlash from the more militant and nasty among their parishioners (and they do exist), or a backlash from among their fellow clergy or religious. So perhaps we should not be too quick to judge if we do not see an altar crucifix in our churches by Christmas. That said, there may be some places where, having used an altar crucifix for some time, the priest now decides to get rid of it. Now that would be making a statement!